The Leica T-Scan takes your scanning experience to a new level of excellence in volumes up to 60m (Ø) in a single set-up. Leica T-Scan 5 is more than 15x faster compared to the previous model and has almost double the stand-off distance, which results in more efficient data capture especially in difficult to reach areas. The combination of Leica T-Scan 5 and Leica Absolute Tracker offers the perfect match to ensure hundreds of millions of accurate points on virtually any surface, from matte black to highly reflective, even carbon fibre all without any special preparation. From integrated wireless connectivity, environmental monitoring and all-day battery power, to overview camera, RapidSight aim scope and ergonomic carry handle, every need is built in. Just one case contains the lightest and most portable sensor and probe as well as IR remote, with various transportation cases for full flexibility. Built-in WiFi with true access point functionality delivers single-user operation through simple PC setup and remote control options via laptops, tablets or smartphones. Automatically re-establishes interrupted line of sight within a wide field of view with no user interaction required. Independent hot-swappable battery power supply allows for quick and easy cable-free setup and all-day wireless operation. The IEC-certified sealed unit guarantees ingress protection against dust and other contaminants, enabling effective measurement in even the harshest environments. Integrated environmental unit monitors conditions including temperature, pressure and humidity to compensate for changes and ensure accurate measurements regardless of external factors. Ultra-large measurement volume of up to 320 metres (ø), with minimum measurement distance less than 0.8 metres. 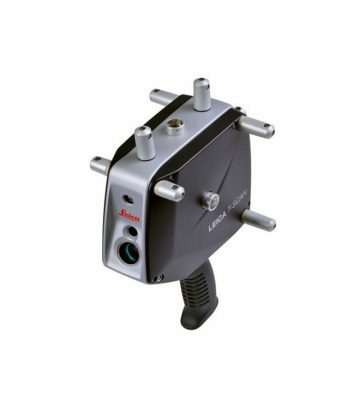 Enables measurement with the Z-axis aligned to gravity, ideal for leveling and alignment tasks. Continuous time and distance measurement mode. Wide operating temperature range of -15 to 45 degrees Celsius. The higher scan rates allow ideal feature recognition, smaller detail detection and much quicker scanning at an approved quality level on all surfaces and colours. The users scanning experience is enhanced with a dual colour guide light and acoustic feedback. 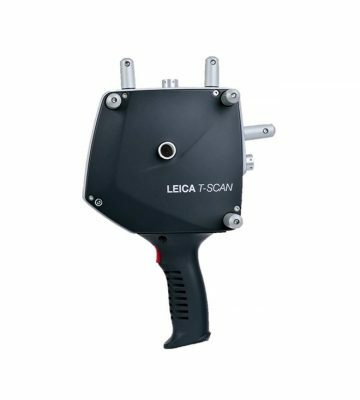 Leica T-Scan 5 is also best qualified for automation and robotic applications, where inspection processes can benefit from maximum laser tracking and machine performance.